The subgenus Pyrosmia Tkalcu is confined to the Palaearctic region. It contains 30 described species. Female of Osmia (Pyrosmia) ferruginea Latreille, 1811. Foto N. Vereecken. 1937 Osmia (Chalcosmia) amathusica Mavromoustakis, Annals and Magazine of Natural History (London), 20: 522. Type material: Holotype f, “Amathus (ruins)” [Cyprus], DAAN (Nicosia); paratypes mm, ff.-Combination Osmia (Diceratosmia) amathusica Mavromoustakis in Tkalcu (1969a: 333). Combination Osmia (Caerulosmia) amathusica Mavromoustakis in Zanden (1988b: 123). Distribution- Europe: GR, GR(Cr), I(Si). Southwestern Asia: CY, IL, JOR, SYR, TR. Identification-Keys, Descriptions: Mavromoustakis (1956a: 857); Warncke (1992b); Zanden (1991a). Flower preferences: The only three pollen samples available so far (from three different localities) consist of pollen of Fabaceae (e.g. Trifolium) and Lamiaceae (A. Müller, unpublished). 1879 Osmia cyanoxantha Pérez, Actes de la Société Linnéenne de Bordeaux, 33: 185. Type material: Lectotype f, by designation of Zanden (1991a: 52), “Marseille” [France], MNHN (Paris); paralectotypes mm, ff.-Combination Osmia (Chalcosmia) cyanoxantha Pérez in Schmiedeknecht (1885: 20 ). 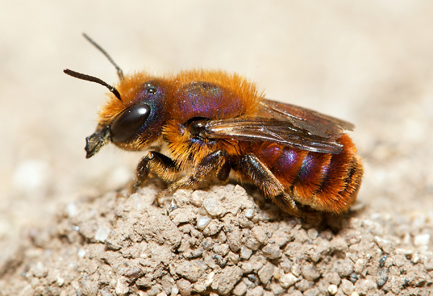 Combination Osmia (Diceratosmia) cyanoxantha Pérez in Tkalcu (1969a: 333). Combination Osmia (Caerulosmia) cyanoxantha Pérez in Zanden (1988b: 123). 1991 Osmia (Caerulosmia) cyanoxura Zanden, Linzer Biologische Beiträge, 23: 53. Type material: Holotype m, “Erimanthos Mts., Pelop.” [Greece], RMNH (Leiden); paratypes mm, ff.-Synonymy in Warncke (1992b: 909). 1992 Osmia (Pyrosmia) elbaba Warncke, Linzer Biologische Beiträge, 24: 904. Type material: Holotype f, “Medjez el Bab” [Tunisia], OLML (Linz); paratype f.-Synonymy in Zanden (1996b: 884). Distribution-Europe: ARM, BG, E, F, F(Co), GR, HR, I, I(Si), MK, P, SLO. Northern Africa: DZ, MA, TN. Southwestern Asia: CY, IL, IR, JOR, SYR, TR. Identification-Keys, Descriptions: Amiet et al. (2004); Benoist (1931); Ducke (1900); Schmiedeknecht (1885-1886); Warncke (1992b); Zanden (1991a). Flower preferences: Polylectic; pollen sources recorded so far include Fabaceae (e.g. Lotus), Echium (Boraginaceae) and Lamiaceae (A. Müller, unpublished, based on 10 pollen samples from 8 different localities) . 1895 Osmia derasa Pérez, Espèces nouvelles de mellifères de Barbarie, p. 12. Type material: Lectotype f, by designation of Tkalcu (1970: 9), “Tèniet” [Algeria], MNHN (Paris).-Combination Osmia (Diceratosmia) derasa Pérez in Tkalcu (1969a: 333). Combination Osmia (Caerulosmia) derasa Pérez in Zanden (1988b: 123). 1929 Osmia Crosi Benoist, Bulletin de la Société Entomologique de France, 1929: 96. Type material: Lectotype m, by designation of Zanden (1985: 55), “Mascara” [Algeria], MNHN (Paris); paralectotype m.-Combination Osmia (Diceratosmia) crosi Benoist in Tkalcu (1969a: 333). Combination Osmia (Caerulosmia) crosi Benoist in Zanden (1988b: 123).-Synonymy with Osmia derasa Pérez in Warncke (1992b: 905). Synonymy with Osmia tricolor Saunders in Zanden (1995: 429), which is a mistake (T. Griswold, personal communication). 1950 Osmia pseudoderasa Benoist, Bulletin de la Société des Sciences Naturelles du Maroc (Rabat), 30: 184. Type material: Holotype f, “Midelt” [Morocco], MZLS (Lausanne).-Synonymy in Zanden (1985: 68). Distribution-Northern Africa: DZ, LAR, MA, TN. Identification-Keys, Descriptions: Tkalcu (1970: 9; 1975a: 183); Zanden (1991a; 1994b: 1120). Flower preferences: Polylectic; pollen sources recorded so far include Fabaceae and Echium (Boraginaceae) (A. Müller, unpublished, based on 5 pollen samples from 5 different localities). 1896 Automatically established nominotypical subspecific taxon (original description and type specimen are identical with those of the species rank taxon of the same name above). Identification-Keys, Descriptions:No supplementary or more detailed morphological description known. 1992 Osmia (Pyrosmia) derasa violetta Warncke, Linzer Biologische Beiträge, 24: 905. Type material: Holotype f, “Cap Bon” [Tunisia], OLML (Linz); paratypes m(m), f(f). 1875 Osmia dilaticornis Morawitz, Travel to Turkestan by A. P. Fedtschenko, p. 87. Type material: Holotype m, “prope Taschkent” [Uzbekistan], ZMUM (Moscow).-Combination Osmia (Diceratosmia) dilaticornis Morawitz in Tkalcu (1969a: 333). Combination Osmia (Caerulosmia) dilaticornis Morawitz in Zanden (1988b: 123). Distribution-Europe: GR. Northern Asia: TJ, UZ. Southwestern Asia: IL, IR, JOR, SYR, TR. Identification-Keys, Descriptions: Warncke (1992b); Zanden (1989: 85-86, 1991a). Flower preferences: Possibly oligolectic on Fabaceae (A. Müller, unpublished, based on 7 pollen samples from 4 different localities). 1811 Osmia ferruginea Latreille, Encyclopédie Méthodique, Histoire Naturelle, Insectes, vol. 8, p. 579. Type material: f(f), [Egypt]. Type species of Pyrosmia Tkalcu.-Combination Osmia (Chalcosmia) ferruginea Latreille in Friese (1911b: 109). 1849 Osmia metallica Lucas, Exploration scientifique de l’Algérie, p. 191. Type material: Holotype f, “environs de Misserghin” [Algeria], MNHN (Paris).-Synonymy in Zanden (1988b: 127). Distribution-Europe: E, F, F(Co), I(Sa), I(Si), M, P; GR. Northern Africa: DZ, ET, LAR, MA, TN. Southwestern Asia: CY, IL, JOR, SYR. Identification-Keys, Descriptions: Benoist (1931); Ducke (1900); Warncke (1992b). Flower preferences: Polylectic with a preference for Fabaceae; additional pollen sources include Boraginaceae (Echiochilon, Echium), Reseda (Resedaceae), Lamiaceae, Antirrhineae, Brassicaceae, Cistaceae and monocots (A. Müller, unpublished, based on 64 pollen samples from 41 different localities and on field observations). 1811 Automatically established nominotypical subspecific taxon (original description and type specimen are identical with those of the species rank taxon of the same name above). Distribution-Europe: E, F, P; GR.Northern Africa: DZ, ET, LAR, MA, TN. Southwestern Asia: CY, IL, JOR. 1882 Osmia igneo-purpurea Costa, Rendiconti dell’Academia delle Scienze Fisiche e Matematiche de Napoli, 21: 198. Type material: f(f), [Italy: Sardinia].-Synonymy with Osmia ferruginea Latreille in Tkalcu (1975a: 182).-Combination Osmia (Pyrosmia) ferruginea igneopurpurea Costa in Warncke (1992b: 917). Distribution-Europe: F(Co), I(Sa), I(Si), M.
Identification-Keys, Descriptions:Benoist (1931);Ferton (1897: 39); Schmiedeknecht (1885-1886); Warncke (1992b). 1989 Osmia (Caerulosmia) forticornis Zanden, Entomologische Abhandlungen (Dresden), 53: 85. Type material: Holotype m, “Chelmos Pelopon., 1900 m” [Greece], RMNH (Leiden); paratypes mm, ff. Distribution-Europe: ARM, GR. Southwestern Asia: TR. Identification-Keys, Descriptions: Warncke (1992b); Zanden (1991a). Flower preferences: Polylectic; pollen sources recorded so far include Fabaceae and Lamiaceae (A. Müller, unpublished, based on 5 pollen samples from 4 different localities). 1895 Osmia purpurea Pérez, Espèces nouvelles de mellifères de Barbarie, p. 11. NOMEN PRAEOCCUPATUM [not Osmia purpurea Cresson, 1864]. Type material: Lectotype m, by designation of Zanden (1991a: 57), “Tunis” [Tunisia], MNHN (Paris); paralectotype f.
1896 Osmia gemmea Pérez, Correctures: Espèces nouvelles de mellifères de Barbarie, not paginated single page appendix to Pérez (1895). NOMEN NOVUM with same type specimen for preoccupied Osmia purpurea Pérez, 1895 [not Osmia purpurea Cresson, 1864].-Combination Osmia (Chalcosmia) gemmea Pérez in Friese (1911b: 109). Combination Osmia (Diceratosmia) gemmea Pérez in Tkalcu (1969a: 333). Combination Osmia (Caerulosmia) gemmea Pérez in Zanden (1988b: 123). 1899 Osmia ligulicornis Friese, Entomologische Nachrichten (Berlin), 25: 330. Type material: Lectotype f, by designation of Zanden (1987: 78), “Jaffa” [Israel], ZMHB (Berlin).-Synonymy in Zanden (1987: 78). Distribution-Northern Africa: DZ, ET, LAR, MA, TN. Southwestern Asia: IL. Identification-Keys, Descriptions: Alfken (1942: 214-215); Warncke (1992b); Zanden (1991a). Flower preferences: Polylectic; pollen sources recorded so far are Fabaceae (e.g. Retama), Echium (Boraginaceae), Reseda (Resedaceae) and probably Antirrhineae (A. Müller, unpublished, based on 8 pollen samples from 7 different localities). 1992 Osmia (Pyrosmia) hermona Warncke, Linzer Biologische Beiträge, 24: 906. Type material: Holotype m, “Mt. Hermon in 2050 m” [Israel], OLML (Linz); paratypes mm, ff. Distribution-Northern Asia: TJ. Southwestern Asia: IL, SYR, TR. Flower preferences: Unknown. The only pollen sample available so far consists of pollen of Fabaceae (A. Müller, unpublished). 1969 Osmia (Chalcosmia) laticauda Stanek, Nachrichten des Naturwissenschaftlichen Museums der Stadt Aschaffenburg, 78: 5. Type material: Holotype m, “Mut-Sertavul, 1410 m” [Turkey], SMFD (Frankfurt).-Combination Osmia (Caerulosmia) laticauda Stanek in Zanden (1988b: 123). 1992 Osmia tichodroma Warncke, Linzer Biologische Beiträge, 24: 912. NOMEN NOVUM with same type specimen for preoccupied Osmia laticauda Stanek, 1969 [not Heriades laticaudus Benoist, 1938]. Distribution-Europe: BG, GR, MK. Southwestern Asia: IR, TR. 1899 Osmia lobata Friese, Entomologische Nachrichten (Berlin), 25: 63. Type material: Holotype m, “Algerien” [Algeria], ZMHB (Berlin).-Combination Osmia (Chalcosmia) lobata Friese in Friese (1911b: 111). Combination Osmia (Diceratosmia) lobata Friese in Tkalcu (1969a: 333). Combination Osmia (Caerulosmia) lobata Friese in Zanden (1988b: 123). 1899 Osmia leucopyga Ducke, Entomologische Nachrichten (Berlin), 25: 214. Type material: Holotype f, “Constantine” [Algeria], ZMHB (Berlin).-Combination Osmia (Caerulosmia) leucopyga Ducke in Zanden (1988b: 123).-Synonymy in Warncke (1992b: 910). Distribution-Europe: E, P. Northern Africa: DZ, MA, TN. Southwestern Asia: IL. Identification-Keys, Descriptions: Ducke (1900); Zanden (1991a). 1880 Osmia mongolica Morawitz, Bulletin de l’Académie Impériale des Sciences de St.-Pétersbourg, 26: 382. Type material: Lectotype f, by designation of Tkalcu (1995: 137), “südöstliche Mongolei” [Mongolia], ZIN (St. Petersburg).-Combination Osmia (Chalcosmia) mongolica Morawitz in Zanden (1988b: 125). Combination Osmia (Helicosmia) mongolica Morawitz in Wu (2006: 62). 1930 Osmia jacoti lilacina Cockerell, The Entomologist (London), 63: 83. Type material: f(f), “Tsinan, near the Shantung Christian University” [China].-Synonymy in Zanden (1988b: 125), but see Tkalcu (1995: 137). Identification-Keys, Descriptions: Ducke (1900); Tkalcu (1995: 137-138); Wu (2006). 1984 Osmia (Diceratosmia) moreensis Zanden, Reichenbachia (Dresden), 22: 184. Type material: Holotype m, “Rodini, Rhodos” [Greece], RMNH (Leiden); paratypes mm, ff.-Combination Osmia (Caerulosmia) moreensis Zanden in Zanden (1988b: 123). Distribution-Europe: GR, GR(Cr). Southwestern Asia: IL, SYR, TR. Flower preferences: Possibly oligoletic on Fabaceae; all five pollen samples available so far (from 5 different localities) consist of pollen of Fabaceae (e.g. Trifolium) (A. Müller, unpublished). 1992 Osmia (Pyrosmia) oramara Warncke, Linzer Biologische Beiträge, 24: 908. Type material: Holotype f, “Oramar in 1500 m/Hakkari” [Turkey], OLML (Linz); paratypes ff. Nesting biology-Nesting site: Preexisting cavities: fissures and cavities between flat stones. Brood cells were found immediately below the soil surface down to a depth of 5cm. Old brood cells are repaired and reused. Up to 100 females were observed to nest closely together. Nesting material: Cells (8-9mm long) are entirely constructed from leaf pulp, without admixture of sand or small pebbles. They are not built freely between the stones, but are attached to each other or to the substrate. As the substrate also gets covered with chewed leaves, the cell chamber is completely surrounded by leaf pulp. (C. Sedivy, C. Praz and A. Müller, unpublished). Flower preferences: Possibly oligolectic on Fabaceae; 14 pollen samples from 4 different localities and three brood cells from the same locality exclusively consist of pollen of Astragalus (A. Müller, unpublished). 1992 Osmia (Pyrosmia) polkruga Warncke, Linzer Biologische Beiträge, 24: 915. Type material: Holotype f, “80 km NO Aqaba an der Strasse nach Amman” [Jordan], OLML (Linz). 1895 Osmia punica Pérez, Espèces nouvelles de mellifères de Barbarie, p. 11. Type material: Lectotype m, by designation of Zanden (1991a: 61), “Constantine” [Algeria], MNHN (Paris); paralectotypes mm.-Combination Osmia (Chalcosmia) punica Pérez in Friese (1911b: 113). Combination Osmia (Diceratosmia) punica Pérez in Tkalcu (1969a: 333). Combination Osmia (Caerulosmia) punica Pérez in Zanden (1988b: 124). Distribution-Northern Africa: DZ, ET, LAR, MA, TN. Flower preferences: Polylectic with a preference for Fabaceae; additional pollen sources include Boraginaceae (e.g. Echium) and probably Antirrhineae (A. Müller, unpublished, based on 14 pollen samples from 11 different localities). 1992 Osmia (Pyrosmia) punica irherma Warncke, Linzer Biologische Beiträge, 24: 905. Type material: Holotype f, “50 km OSO Marrakesch” [Morocco], OLML (Linz); paratypes ff. Distribution-Northern Africa: DZ, ET, LAR, MA. 1899 Osmia saxicola Ducke, Entomologische Nachrichten (Berlin), 25: 215. Type material: Lectotype m, by designation by Peters (Zanden, 1991a: 63), “bei Triest” [Italy], ZMHB (Berlin); paralectotype m. Type species of Viridosmia Warncke.-Combination Osmia (Chalcosmia) saxicola Ducke in Friese (1911b: 112). Combination Osmia (Diceratosmia) saxicola Ducke in Tkalcu (1969a: 333). Combination Osmia (Caerulosmia) saxicola Ducke in Zanden (1988b: 124). 1934 Osmia caelestina Benoist, Bulletin de la Société Entomologique de France, 39: 160. Type material: Holotype f, “Asie mineure: Jaffa” [Israel], MNHN (Paris).-Combination Osmia (Diceratosmia) caelestina Benoist in Zanden (1985: 66). Combination Osmia (Caerulosmia) caelestina Benoist in Zanden (1988b: 123).-Synonymy in Warncke (1992b: 907). 1937 Osmia (Chalcosmia) cypricola Mavromoustakis, The Annals and Magazine of Natural History (London), 20: 520. Type material: Holotype f, “Pera Pedi” [Cyprus], DAAN (Nicosia); paratypes mm, ff.-Combination Osmia (Diceratosmia) cypricola Mavromoustakis in Tkalcu (1969a: 333). Combination Osmia (Caerulosmia) cypricola Mavromoustakis in Zanden (1988b: 123).-Synonymy in Warncke (1992b: 907). 1956 Osmia (Chalcosmia) posti Mavromoustakis, The Annals and Magazine of Natural History (London), ser. 12, 9: 856. Type material: Holotype f, “Jebel el Knaissé, 1700 m” [Lebanon], DAAN (Nicosia); paratype m.-Combination Osmia (Diceratosmia) posti Mavromoustakis in Tkalcu (1969a: 333). Combination Osmia (Caerulosmia) posti Mavromoustakis in Zanden (1988b: 124).-Synonymy in Warncke (1992b: 907). Distribution-Europe: E, F, GR, GR(Cr),HR, I, SCG. Northern Asia: TJ. Southwestern Asia: CY, IL, IR, JOR, RL, SYR, TR. Identification-Keys, Descriptions: Ducke (1900); Mavromoustakis (1956a: 857); Warncke (1992b); Zanden (1985: 66, 1991a). Flower preferences: Polylectic with a probable preference for Fabaceae (e.g. Lotus); additional pollen sources include Brassicaceae, Allium (Alliaceae) and an unknown pollen host (A. Müller, unpublished, based on 14 pollen samples from 10 different localities). 1992 Osmia saxicola riemanni Warncke, Linzer Biologische Beiträge, 24: 908. Type material: Holotype f, “Malia/32 km O Heraklion, Kreta” [Greece: Crete], OLML (Linz); paratypes ff. 1899 Automatically established nominotypical subspecific taxon (original description and type specimen are identical with those of the species rank taxon of the same name above). Distribution-Europe: E, F, GR, HR, I, SCG. Northern Asia: TJ. Southwestern Asia: CY, IL, JOR, RL, TR. 1870 Osmia submicans Morawitz, Horae Societatis Entomologicae Rossicae (St. Petersburg), 7: 314. Type material: Lectotype f, by designation of Zanden (1991a: 64), “Tauria” [Ukraine], ZIN (St. Petersburg); paralectotype f.-Combination Osmia (Chalcosmia) submicans Morawitz in Friese (1911b: 113). Combination Osmia (Diceratosmia) submicans Morawitz in Tkalcu (1969a: 333). Combination Osmia (Caerulosmia) submicans Morawitz in Zanden (1988b: 124). 1886 Osmia (Chalcosmia) Giraudi Schmiedeknecht, Apidae Europaeae, vol. 2, p. 117 . Type material: Lectotype f, by designation of Zanden (1991a: 64), “Mallorca, Miramar” [Spain: Balearic Islands], ZMHB (Berlin).-Synonymy in Ferton (1908: 539). Distribution-Europe: CH, CZ, D, E, E(Ba), F, F(Co), FL, GR, GR(Cr), H, HR, I, I(Sa), I(Si), M, MK, P, RUS, SK, SLO, UA. Northern Africa: DZ, E(Ca), ET, LAR, MA, TN. Southwestern Asia: CY, IL, JOR, RL, SYR, TR. Identification-Keys, Descriptions: Amiet et al. (2004); Banaszak and Romasenko (2001); Benoist (1931); Ducke (1900); Medvedeva (1978); Móczár (1958); Scheuchl (1996); Schmiedeknecht (1885-1886); Warncke (1992b); Zanden (1991a). Flower preferences: Polylectic with a strong preference for Fabaceae; additional pollen sources include Cistaceae, Reseda (Resedaceae), Echium (Boraginaceae), Lamiaceae (Lamioideae, Nepetoideae), Crassulaceae, Campanulaceae and Antirrhineae (Amiet et al., 2004; Westrich, 1989; A. Müller, unpublished, based on 45 pollen samples from 37 different localities). 1957 Osmia submicans canaria Mavromoustakis, Societas Scientiarum Fennica, Commentationes Biologicae (Helsinki), 16: 1. Type material: Holotype f, “Gran Canaria, Arucas” [Spain: Canary Islands], FMNH (Helsinki).-Combination Osmia (Diceratosmia) canaria Mavromoustakis in Tkalcu (1977c: 97). Combination Osmia (Pyrosmia) submicans canaria Mavromoustakis in Peters (1975: 50) and in Warncke (1992b: 911). Identification-Keys, Descriptions: Peters (1975: 50, 54-55); Tkalcu (1977c: 97; 1993b: 816-820); Zanden (1991a, 1996b: 892). 1996 Osmia (Pyrosmia) submicans columbina Zanden, Linzer Biologische Beiträge, 28: 891. Type material: Holotype f, “Puntagorde, Isla La Palma, Cumbercito” [Spain: Canary Islands], RMNH (Leiden); paratypes mm, f.
1934 Osmia hebraea Benoist, Bulletin de la Société Entomologique de France, 39: 160. Type material: Holotype f, “Asie mineure: Jérusalem” [Israel], MNHN (Paris).-Combination Osmia (Diceratosmia) hebraea Benoist in Tkalcu (1969a: 333). Combination Osmia submicans hebraea Benoist in Zanden (1988b: 124). 1969 Osmia aurantiaca Stanek, Annalen des Naturhistorischen Museums in Wien, 73: 379. Type material: Holotype m, “El Doqqi” [Egypt], USNM (Washington); paratypes mm.-Combination Osmia (Diceratosmia) submicans aurantiaca Stanek in Tkalcu (1977c: 94).-Synonymy in Zanden (1985: 67). Distribution-Europe: I(Si), M. Northern Africa: DZ, ET, LAR, MA, TN. Southwestern Asia: CY, IL, JOR, RL, SYR, TR. Identification-Keys, Descriptions: Tkalcu (1977c: 94-97); Zanden (1991a, 1996b: 892). 1992 Osmia (Pyrosmia) submicans lanzarotae Warncke, Linzer Biologische Beiträge, 24: 911. Type material: Holotype f, “Penas del Chache, Lanzarote” [Spain: Canary Islands], OLML (Linz); paratypes ff. 1993 Osmia (Caerulosmia) lanzarotensis Tkalcu, Veröffentlichungen des Übersee-Museum Bremen (Naturwissenschaften), 12: 816. Type material: Holotype f, “Lanzarote 300 m La Florida 10 km NW Arrecife” [Spain: Canary Islands], MICN (Santa Cruz de Tenerife); paratypes mm, ff.-New synonymy based on the original description. Identification-Keys, Descriptions: Zanden (1996b: 892). 1870 Automatically established nominotypical subspecific taxon (original description and type specimen are identical with those of the species rank taxon of the same name above). Distribution-Europe: CH, CZ, D, E, E(Ba), F, F(Co), FL, GR, GR(Cr), H, HR, I, I(Sa), MK, P, RUS, SK, SLO, UA. Identification-Keys, Descriptions: Mavromoustakis (1957a: 2); Tkalcu (1977c: 97, 1993b: 816-820); Zanden (1996b: 892). 1811 Osmia versicolor Latreille, Encyclopédie Méthodique, Histoire Naturelle, Insectes, vol. 8, p. 586. Type material: Neotype f, by designation of Zanden (1984c: 182), “Cattolica” [Italy], RMNH (Leiden), in original description “près de Marseille” [France], see Warncke (1992b: 915).-Combination Osmia (Chalcosmia) versicolor Latreille in Schmiedeknecht (1885: 20 ). Combination Osmia (Diceratosmia) versicolor Latreille in Tkalcu (1969a: 333). Combination Osmia (Caerulosmia) versicolor Latreille in Zanden (1988b: 124). Distribution-Europe: AL, BG, D, E, E(Ba), F, F(Co), GE, GR, GR(Cr), H, HR, I, I(Sa), I(Si), MK, P, RUS, SLO; CH. Northern Africa: DZ, LAR, MA, TN. Southwestern Asia: IL, JOR, RL, SYR, TR. Identification-Keys, Descriptions: Amiet et al. (2004); Banaszak and Romasenko (2001); Benoist (1931); Ducke (1900); Medvedeva (1978); Móczár (1958); Scheuchl (1996); Schmiedeknecht (1885-1886); Warncke (1992b); Zanden (1984c: 184, 1991a). Flower preferences: Polylectic with a strong preference for Fabaceae; additional pollen sources include Lamiaceae, Echium (Boraginaceae), Brassicaceae, Cistaceae, Crassulaceae, Campanulaceae and Asteraceae (Asteroideae, Cichorioideae) (Amiet et al., 2004; Westrich, 1989; A. Müller, unpublished, based on 44 pollen samples from 37 different localities). 1835 Osmia corrusca Erichson, in: Waltl, Reise durch Tirol, Oberitalien und Piemont nach dem südlichen Spanien (Passau), vol. 2, p. 107. Type material: Lectotype f, by designation of Zanden (1991a: 67), “Andalusien” [Spain], ZMHB (Berlin).-Combination Osmia (Caerulosmia) versicolor corrusca Erichson in Zanden (1988b: 124). 1857 Megachile laeta Gistel, Vacuna, 2: 564. NOMEN PRAEOCCUPATUM (not Megachile laeta Smith, 1853). Type material: f(f), “Algarbia” [Portugal].-Synonymy in Warncke (1992b: 916). 1917 Megachile algarbiensis Strand, Archiv für Naturgeschichte, 82: 98. NOMEN NOVUM with same type specimen for preoccupied Megachile laeta Gistel, 1857 [not Megachile laeta Smith, 1853]. Distribution-Europe: E, E(Ba), F(Co), P; I(Si). Northern Africa: DZ, LAR, MA, TN. Identification-Keys, Descriptions: Warncke (1992b); Zanden (1984c: 183, 1991a). Distribution-Europe: AL, BG, D, E, F, GE, GR, GR(Cr), H, HR, I, I(Sa), I(Si), MK, P, RUS, SLO. 1992 Osmia (Pyrosmia) versicolor viricephalica Warncke, Linzer Biologische Beiträge, 24: 916. Type material: Holotype f, “Efes/Aydin” [Turkey], OLML (Linz); paratypes mm, ff. Distribution-Southwestern Asia: IL, JOR, RL, SYR, TR. 1874 Osmia viridana Morawitz, Horae Societatis Entomologicae Rossicae (St. Petersburg), 10: 150. Type material: Lectotype f, by designation of Zanden (1984c: 183), “Derbent” [Russia], ZIN (St. Petersburg); paralectotypes mm.-Combination Osmia (Chalcosmia) viridana Morawitz in Schmiedeknecht (1885: 20 ). Combination Osmia (Diceratosmia) viridana Morawitz in Tkalcu (1969a: 333). Combination Osmia (Caerulosmia) viridana Morawitz in Zanden (1988b: 124). 1896 Osmia angulata Pérez, Espèces nouvelles de mellifères de Barbarie, p. 11. Type material: Lectotype m, see Warncke (1992b: 913), “Marseille” [France], MNHN (Paris).-Combination Osmia (Diceratosmia) angulata Pérez in Tkalcu (1969a: 333).-Synonymy in Zanden (1991a: 68). 1984 Osmia (Diceratosmia) viridana mulleolus Zanden, Reichenbachia (Dresden), 22: 184. Type material: Holotype f, “Kavarna” [Bulgaria], RMNH (Leiden); paratypes mm, ff.-Combination Osmia (Caerulosmia) viridana mulleolus Zanden in Zanden (1988b: 124).-Synonymy in Warncke (1992b: 913). Distribution-Europe: ARM, BG, CH, D, E, F, GR, GR(Cr), HR, I, MK, RUS(SR), SLO, UA; Caucasus. Northern Africa: DZ, TN. Northern Asia: KS, KZ, TJ, TM, UZ. Southwestern Asia: CY, IL, IR, JOR, SYR, TR. Flower preferences: Polylectic with a strong preference for Fabaceae; additional pollen sources include Lamiaceae, Echium (Boraginaceae), Brassicaceae, Crassulaceae and monocots (Amiet et al., 2004; Westrich, 1989; A. Müller, unpublished, based on 49 pollen samples from 37 different localities). 1939 Osmia (Chalcosmia) nicosiana Mavromoustakis, The Annals and Magazine of Natural History (London), ser. 11, 3: 155. Type material: Holotype f, “Ayia Phyla” [Cyprus], DAAN (Nicosia); paratypes mm, ff.-Combination Osmia (Caerulosmia) nicosiana Mavromoustakis in Zanden (1988b: 124). Combination Osmia (Pyrosmia) viridana nicosiana Mavromoustakis in Warncke (1992b: 913). 1875 Osmia rufispina Morawitz, Travel to Turkestan by A. P. Fedtschenko, p. 83. Type material: Holotype f, “in valle Sarafschan” [Tajikistan], ZMUM (Moscow).-Combination Osmia (Caerulosmia) rufispina Morawitz in Zanden (1988b: 124). Combination Osmia (Pyrosmia) viridana rufispina Morawitz in Warncke (1992b: 913). Distribution-Northern Asia: KS, KZ, TJ, TM, UZ. Identification-Keys, Descriptions: Warncke (1992b); Zanden (1991a). Note: Male unknown. 1874 Automatically established nominotypical subspecific taxon (original description and type specimen are identical with those of the species rank taxon of the same name above). Distribution-Europe: ARM, BG, CH, D, E, F, GR, GR(Cr), HR, I, MK, RUS(SR), SLO, UA; Caucasus. Northern Africa: DZ, TN. Southwestern Asia: IL, IR, JOR, SYR, TR. 1992 Osmia (Pyrosmia) zarzisa Warncke, Linzer Biologische Beiträge, 24: 913. Type material: Holotype m, “30 km S Zarzis” [Tunisia], OLML (Linz); paratypes mm, f.
1870 Osmia cephalotes Morawitz, Horae Societatis Entomologicae Rossicae (St. Petersburg), 7: 315. Type material: Holotype f, “Gallia merid., in der Umgebung von Nizza” [France], ZIN (St. Petersburg).-Combination Osmia (Chalcosmia) cephalotes Morawitz in Schmiedeknecht (1885: 20 ). Combination Osmia (Caerulosmia) cephalotes Morawitz in Zanden (1988b: 123). 1879 Osmia bacillus Pérez, Actes de la Société Linnéenne de Bordeaux, 33: 203. Type material: f(f), “Marseille” [France], MNHN (Paris).-Synonymy with Osmia longiceps Morawitz in Dalla Torre (1896: 401). 1899 Osmia pulsata Buysson, Annales de la Société Entomologique de France, 68: 668. Type material: Holotype m, “Tunis” [Tunisia], MNHN (Paris).-Synonymy in Zanden (1986: 73). Distribution-Europe: ARM, AZ, BG, E, F, GE, GR, H, HR, I, I(Si), P, RO, RUS, SLO. Northern Africa: DZ, LAR, MA, TN. Northern Asia: TM. Southwestern Asia: CY, IL, IR, JOR, SYR, TR. Identification-Keys, Descriptions: Banaszak and Romasenko (2001); Benoist (1931); Ducke (1897: 40); Móczár (1958); Warncke (1992b); Zanden (1991a). Flower preferences: Polylectic with a preference for Fabaceae; additional pollen sources include Echium (Boraginaceae), Lamiaceae (Lamioideae, Nepetoideae), monocots and Cistaceae (A. Müller, unpublished, based on 26 pollen samples from 25 different localities and on field observations). Flower records: Salvia fruticosa (label record). Distribution-Europe: E, F, I, I(Si), P. Northern Africa: DZ, LAR, MA, TN. Identification-Keys, Descriptions: Ducke (1900); Schmiedeknecht (1885-1886); Zanden (1991a). 1876 Osmia longiceps Morawitz, Horae Societatis Entomologicae Rossicae (St. Petersburg), 12: 40. Type material: Lectotype f, by designation of Zanden (1991a: 51), “Borshom” [Georgia], ZIN (St. Petersburg).-Combination Osmia (Chalcosmia) longiceps Morawitz in Schmiedeknecht (1885: 20 ).-Synonymy with Osmia cephalotes Morawitz in Alfken (1914: 201).-Combination Osmia (Caerulosmia) cephalotes longiceps Morawitz in Zanden (1988b: 123). Distribution-Europe: ARM, AZ, BG, GE, GR, H, HR, I, RO, RUS, SLO. Northern Asia: TM. Southwestern Asia: CY, IL, IR, JOR, SYR, TR. 1808 Osmia gallarum Spinola, Insectorum Liguriae, vol. 2, p. 69. Type material: Neotype f, by designation of Zanden (1984c: 187), “Venezia-Ciulia” [Italy], RMNH (Leiden).-Type species of Caerulosmia Zanden.-Combination Osmia (Chalcosmia) gallarum Spinola in Schmiedeknecht (1885: 20 ). Combination Osmia (Diceratosmia) gallarum Spinola in Tkalcu (1969a: 333). Combination Osmia (Caerulosmia) gallarum Spinola in Zanden (1988b: 123). 1840 Osmia ruborum Dufour & Perris, Annales de la Société Entomologique de France, 9: 13. Type material: Lectotype f, by designation of Zanden (1991a: 56), “Gallia meridionali-occidentali (Landes)” [France], MNHN (Paris).-Synonymy in Zanden (1991a: 56). Distribution-Europe: A, AL, BG, CH, CZ, D, E, F, GR, H, HR, I, L, MK, P, PL, RO, RUS, SK, SLO. Northern Africa: DZ, MA, TN. Southwestern Asia: TR. Identification-Keys, Descriptions: Amiet et al. (2004); Banaszak and Romasenko (2001); Benoist (1931); Ducke (1900); Mavromoustakis (1956a: 857); Medvedeva (1978); Móczár (1958); Scheuchl (1996); Schmiedeknecht (1885-1886); Warncke (1992b); Zanden (1984c: 186-191, 1991a). Flower preferences: Oligolectic on Fabaceae (Amiet et al., 2004; Westrich, 1989; A. Müller, unpublished, based on 6 pollen samples from 6 different localities and on field observations). 1808 Automatically established nominotypical subspecific taxon (original description and type specimen are identical with those of the species rank taxon of the same name above). Distribution-Europe: A, AL, BG, CH, CZ, D, E, F, GR, H, HR, I, L, MK, P, PL, RO, RUS, SK, SLO. Southwestern Asia: TR. 1920 Osmia lapidistructor Ferton, Annales de la Société Entomologique de France (Paris), 89: 343. Type material: Holotype f, “La Calle” [Algeria], MNHN (Paris).-Synonymy with Osmia gallarum Spinola in Zanden (1988b: 123).-Combination Osmia gallarum lapidistructor Ferton in Warncke (1992b: 904). Distribution-Northern Africa: DZ, MA, TN. 1984 Osmia (Diceratosmia) hellados Zanden, Reichenbachia (Dresden), 22: 189. Type material: Holotype m, “Palaiokastritsa, Korfu” [Greece], RMNH (Leiden); paratypes mm, ff.-Combination Osmia (Caerulosmia) hellados Zanden in Zanden (1988b: 115). Combination Osmia (Pyrosmia) gallarum hellados Zanden in Warncke (1992b: 903). Combination Osmia hellados Zanden in Standfuss et al. (2003: 302). Distribution-Europe: AZ, BG, GE, GR, GR(Cr, Aegina), HR, I(Si); Yugoslavia. Southwestern Asia: CY, IL, JOR, TR. Flower preferences: Unknown.The only pollen sample available so far consists of pollen of Fabaceae (A. Müller, unpublished). 1992 Osmia (Pyrosmia) avedata Warncke, Linzer Biologische Beiträge, 24: 901. Type material: Holotype f, “Avedat” [Israel], OLML (Linz); paratypes m(m), f(f). 1874 Osmia nanaMorawitz, Horae Societatis Entomologicae Rossicae (St. Petersburg), 10: 152. Type material: Lectotype m, by designation of Zanden (1981: 154), “Derbent” [Russia], ZIN (St. Petersburg).-Combination Osmia (Chalcosmia) nana Morawitz in Friese (1911b: 111). Combination Osmia (Diceratosmia) nana Morawitz in Zanden (1981: 153). Combination Osmia (Caerulosmia) nana Morawitz in Zanden (1988b: 123). 1934 Osmia tetrodonta Benoist, Bulletin de la Société Entomologique de France, 39: 106. Type material: Holotype m, “Asie mineure: Betmeri” [Lebanon], MNHN (Paris).-Synonymy in Zanden (1985: 62). Distribution-Europe: BG, F, GR, GR(Cr), HR, I, I(Sa), I(Si), RUS(SR); Caucasus. Northern Africa: DZ?. Northern Asia: Turkestan. Southwestern Asia: CY, IL, IR, JOR, RL, SYR, TR. Identification-Keys, Descriptions: Ducke (1900); Medvedeva (1978); Stanek (1969a: 39-40); Warncke (1992b); Zanden (1981: 153-156, 1985: 61, 1991a). Flower preferences: Polylectic with a strong preference for Fabaceae; additional pollen sources include Lamiaceae and an unknown pollen host (A. Müller, unpublished, based on 30 pollen samples from 28 different localities). 1992 Osmia (Pyrosmia) nigricollis Warncke, Linzer Biologische Beiträge, 24: 900. Type material: Holotype f, “Semdinli in 1700 m/Hakkari” [Turkey], OLML (Linz); paratypes m(m), f(f). 1992 Osmia (Pyrosmia) ramona Warncke, Linzer Biologische Beiträge, 24: 903. Type material: Holotype f, “Wadi Ramon/6 km O Mizpe Ramon” [Israel], OLML (Linz); paratype f.
1992 Osmia (Pyrosmia) tadjika Warncke, Linzer Biologische Beiträge, 24: 901. Type material: Holotype f, “20 km W Tawil-Dara in 2000 m” [Tajikistan], OLML (Linz); paratype f.
1992 Osmia (Pyrosmia) tawildara Warncke, Linzer Biologische Beiträge, 24: 900. Type material: Holotype f, “20 km W Tawil-Dara in 2000 m” [Tajikistan], OLML (Linz); paratype f.
1981 Osmia (Diceratosmia) teunisseni Zanden, Reichenbachia (Dresden), 19: 156. Type material: Holotype m, “Samos, Manolates” [Greece], RMNH (Leiden); paratypes mm, ff.-Combination Osmia (Caerulosmia) teunisseni Zanden in Zanden (1988b: 124). Distribution-Europe: GR, HR, I. Southwestern Asia: CY, IL, JOR, SYR, TR. Flower preferences: Polylectic; pollen sources recorded so far include Fabaceae, Lamiaceae and Crassulaceae (A. Müller, unpublished, based on 5 pollen samples from 5 different localities).